De-Solv-it® is a highly innovative household cleaning range that has been keeping homes sparkling clean for over 40 years in both the US and UK. 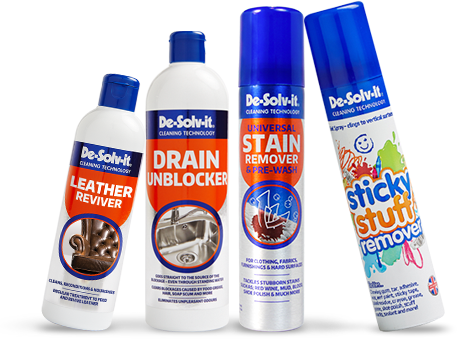 De-Solv-it® has a comprehensive range of award winning products that includes stain removers, household cleaners and of course the much loved De‐Solv‐it® Sticky Stuff ® Remover range. Zep UK Limited, based in Cheshire, is a leading manufacturer and supplier of specialist, high efficacy cleaning solutions for the Retail and Industrial sectors under the brands De-Solv-it®, Zep Commercial® and Mykal®. Our parent company Zep Inc has its headquarters in Atlanta, USA and since its inception in 1937, has been a leader in the production of chemical products for industrial maintenance. De-Solv-it® is the Registered Trademark of The Orange-Sol Group of Companies Ltd.